Sometimes you want something so badly that you chase it for years, and the quest takes over everything. 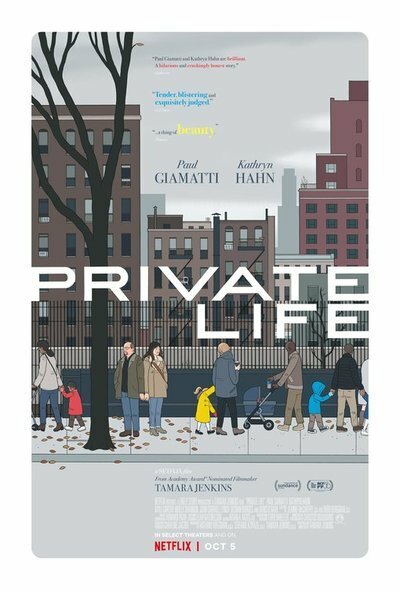 That's what happened to Rachel (Kathryn Hahn) and Richard (Paul Giamatti), the protagonists of "Private Life," a comedy-drama about a forty-something New York couple who are desperate to become parents. Rachel is 41. She's not as fertile as she used to be. Richard is 47. He has just one testicle, and it happens to be blocked. This is a terrible state of affairs for any couple, but a comic gold mine for actors who express frustration as brilliantly as these two. We sense early on that Rachel and Richard's obsession distracts them from dealing with longstanding issues in their marriage, and maybe individual neuroses as well. Richard was once an acclaimed actor and theater impresario. He now runs a pickle-making company. Rachel is a writer who's trying to finish a new novel. She's finding it hard to stay focused with all the obstetrical drama going on. They know having a child is a long shot. They've tried various procedures and treatments and flirted with adoption and surrogates. They refuse to give up. Should they? The first part of "Private Life" follows Rachel and Richard through the medical system, undergoing tests to figure out if they have a specific problem that can be fixed by science. Their fertility sherpa, Dr. Dordick (Denis O'Hare), speaks frankly of the obstacles in their path. They hear him but don't absorb the facts as deeply as they should—or maybe they're just hopeless optimists. Richard and Rachel are close with their in-laws—Richard's brother Charlie (John Carroll Lynch), his second wife Cynthia (Molly Shannon), and Cynthia's college-age daughter Sadie (Kalyi Carter)—and lean on them for emotional support and sometimes more. There's a bit of drama early on when Richard asks Charlie for a loan to pay for a medical test. Cynthia explodes, warning him that they've been at this forever and that he needs to stop enabling them. The movie shifts into a different mode—less raucously funny, more tenderly observant—when Sadie, a budding fiction writer herself, moves in with Richard and Rachel, and the couple asks if she'd donate her eggs. (The movie makes sure to spell out that none of them are related—Charlie being Richard's stepbrother and Cynthia's second husband.) Sadie is intrigued. She needs the money. She loves Richard and Rachel. And she's at her own crossroads in life, and maybe feeling it's time for a gesture as dramatic as anything in the short stories that she loves (or in fiction written by classmates that she gripes about—mostly "thinly veiled autobiographical crap about their upbringing;" Sadie is oblivious to the fact that she's living some of the same cliches she despises in the fiction and the lives of others). I don't want to go into too much detail about the bulk of the story because the plot takes a lot of twists and turns, some predictable, others unexpected, and because what's important are the observations, visual as well as verbal, embedded in each scene. The film's writer-director, Tamara Jenkins ("Slums of Beverly Hills," "Savages") is a brilliant chronicler of upper-middle class white people and their foibles, and her eye for detail is anthropologically exact, empathetic but never begging for sympathy. She's aware that these people can be myopic and petty, and that they're so wrapped up in their individual dramas that they fail to appreciate what they do have; but she also understands the deep biological urges that drive Richard and Rachel, who spent the first part of adulthood committing to an artist's life without taking on responsibility to anyone but each other. The dialogue, especially between Rachel and Richard, is just as astute. We see what drew them together (a shared love of creativity plus undeniable comic chemistry) as well as the despair that they hide from each other for fear of making a tense partnership unpleasant. Each sometimes feels that their failure to conceive is the other's fault, and Jenkins weaves social messaging into their reasons for waiting, acknowledging it as a factor without telling us if she thinks they made good or bad decisions. Richard stings Rachel by suggesting that she's assigning blame for their situation onto the mixed messages she received about family and career back in college. "You can't blame second wave feminism for our ambivalence about having a kid!" he groans. To the film's credit, neither is portrayed as being entirely wrong. The movie also succeeds as a portrait of a particular urban lifestyle—creative people living beyond their means because they don't want to give up youthful dreams of the big city—as well as the larger forces that conspire to make their existence precarious and unrealistic. The Lower East Side New York neighborhood where Rachel and Richard have lived for decades has become almost entirely gentrified (except for their block, which Sadie says is "very 'Serpico'). The site of Richard's old theater company is a bank branch. Condos are springing up everywhere, promising a tourist-like experience of a city that no longer exists. But of course, Richard and Rachel were probably in the first wave of bourgeois settlers back in the '90s, and as such, they have to accept some blame for how things have changed. When Sadie, out for a walk with her possible future egg donors, spots a billboard advertising luxury apartments with the slogan "Live in Luxury, Party Like a Punk," she snarls, "It's like an open invitation for assholes." The movie is aware that they're also the assholes. When they visit Richard's brother and her family in the suburbs, they're seeing a likely future. If they leave the city, does it mean they surrendered? If they don't conceive, does it mean all of that time and money was wasted? It's becoming increasingly hard for films like this to have a big impact on audiences, in part because stories about recognizable, present-day adults of every social class have been largely driven from theaters and onto TV and streaming platforms. Anything that doesn't involve special effects and some kind of world-ending threat is deemed "low stakes" or "television" and thus not worth leaving home to see. (This one is getting a hybrid release from Netflix, playing a small number of theaters while debuting online.) But when the story is told in as engaging and fair-minded a way as it is here by Jenkins—who's as adept with lyrical images as she is with snappy dialogue, and allows us to laugh at the characters even as we feel for them—it's as immersive as any blockbuster, sneakily so. This film is a reminder that the smallness of life can feel huge when we're in the middle of it. A perfect final shot sums up everything "Private Life" has been telling us and showing us, while letting us imagine Rachel and Richard's destiny for ourselves.